Sign Up For Summer Adventure Camp! Please take a moment to read our rules and procedures by clicking HERE. No outside food or beverages are permitted at Body Zone. 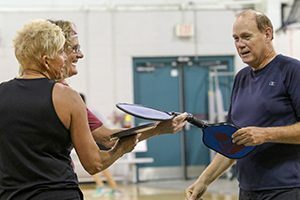 New Player Clinics are held one to two times per month, for one hour, typically just prior to an open play Pickleball session. Clinics are conducted by BZ’s Pickleball regulars who give thorough instruction for first-timers through beginner skill levels. Clinics cost $5 per player, payable at the Guest Services Desk. Advanced registration is not required. Clinics are not open play sessions for intermediate to advanced players. 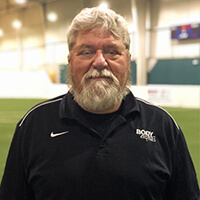 In an effort to accommodate all skill levels, Body Zone is offering Beginner Sessions for players that are learning to play, and may not be quite as competitive as others. These sessions are specifically for players with beginner skill levels looking for recreational play. These sessions do not include instruction. Beginner Sessions are 60-minute sessions typically held one to two times per month. Beginner Sessions cost $5 per player, payable at the Guest Services Desk. Advanced registration is not required. Beginner Sessions are not open play sessions for intermediate to advanced players. You do not need to be a Body Zone or a USAPA member to play. Pickleball is for ages 18+. 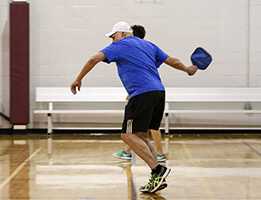 Pickleball is a great game, with fun, camaraderie, great exercise and competition, no matter your age. It all takes place in a social environment that accommodates any level of athleticism from none to advanced. The sport is played on a badminton-sized court with the net lowered to 34 inches at the center. It is played with a perforated plastic baseball, similar to a whiffle ball, and wood or composite paddles. It is easy for beginners to learn, but can develop into a quick, fast-paced, competitive game for experienced players. $5 per player, per session. Payable at the Guest Services Desk. $40 10-session punch cards are available for purchase. Couples/pairs may share a card but please keep in mind that for every session a couple/pair uses a card it counts as two punches. Body Zone has paddles and balls available for use at no additional cost. Sneakers only permitted on the court. Training Room: beginner’s tutorials, playing tips, and instructional video clips. Body Zone has three indoor courts. Enter via the main entrance and check in at the Guest Services Desk. From the desk proceed to the end of the main concourse and make a left. The courts are just past Field #1. No outside food or drink is permitted at Body Zone. Nominate A Rockstar Teacher Or Student For A Free One-Year Membership! Eating Before You Work Out?